A hugely popular dish in its Indian Motherland, Potato & Cauliflower Curry or “Aloo Gobi” is a deliciously simple curry to whip up and is also great for those Meat-Free-Mondays or any other meals you would like to try al-veggie. I made this dish a few weeks ago and put it away in portions for lunch and ready-meals. The recipe below got me about 8 portions which is pretty great considering how little is required to put this together – you are defo getting serious bang for your buck! 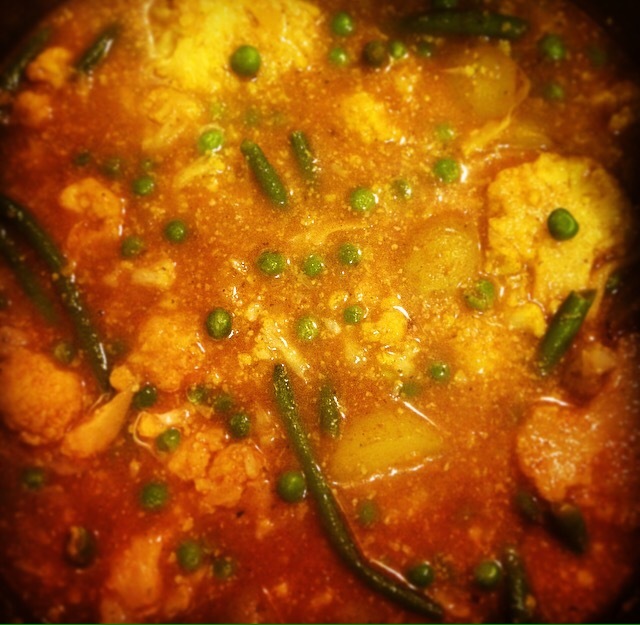 Curries are such good dishes to make when you’re on a budget or time poor and in need of something that will get that metabolism going. This one is packed with vegetables and spices so is a great all-rounder for when you want to get all your nutrients in and stay on top of your healthy meal plan. Potatoes are a great addition to any curry, helping your curry sauce thicken and adding lots of texture. They’re also great in the classic Massaman Curry for those of you who venture to Thai cuisine for your curry fix. Cauliflower is such a superfood as it is and is welcome in any healthy meal you’re making if it fit the bill. The great thing about a home-made curry is you can make it as mild or as spicy as you like so make sure to play around with the seasoning until your happy. Be careful too though as the flavour will develop as the curry cooks so try it intermittently to make sure it doesn’t get too hot for your taste buds. Keep this in the fridge for up to 3 days and you can freeze it off too if you don’t think you’ll get through it all in this space of time. It defrosts quickly and reheats well so is an all-round great recipe for the quick and convenient health-at-home approach. Add the chopped onions and crushed garlic to a heated, oiled pot on the hob and cook until the start to brown and are aromatic (about 1-2 minutes). Add the stock water to the pot and bring to the boil. Reduce to a low heat once bubbling. Add the cauliflower florets, diced potatoes and curry powder to the pot and stir thoroughly. Feel free to add a pinch of your favourite spices at this point too – maybe some chilli flakes for an extra kick? Let the curry mix fuse and simmer for about 5 minutes. Add the tomato purée and some more water if desired, stir through and leave to cook on low for about 10-15 minutes. Do some taste testing during this time and add any seasoning you want to reach the perfect flavour. Right at the end, add the peas, green beans and chopped red chilli. Let these heat through for a couple of minutes and then remove the pot from the heat. Your curry is now ready to serve-straight from pot to plate! OK.. So.. The Christmas Dinner Stuffing – It’s one of the most important components of the Christmas Dinner and one of everyone’s favourite sides. Families and hosts choose to do their stuffing in many different ways so you can interpret this recipe and serving suggestion to whatever method suits you and your meal. This is a quirky version of the staple side but trust me when I tell you it is actually so tasty and works incredibly well as a stuffing. This can be made in advance too as it freezes so well and can be taken out the night before for your prep. Again, you can twist this recipe to make it your own by adding different types of nuts or extra seasoning of what you deem suitable. Other fruits such as pears can also be added. Make sure to make plenty if the people you are cooking for are anything like my family – the stuffing is always one of the first dishes to be finished first and you always need to keep some for the sandwiches later that night and the next day – essential! In a pot on the hob, cook the quinoa as directed on the packet. I usually follow the instructions of bringing the quinoa to the boil, reducing the heat and simmering for 15 minutes. Remove from the heat, drain and let stand for about 10 minutes until all the excess water has been absorbed. Fluff with a fork. Heat some olive oil on a hot pan and add the brown onion, garlic and pine nuts and cook lightly until browned. Add the mix from the pan and all of the other ingredients to the cooked quinoa and mix thoroughly. Serve with your main meal as desired. 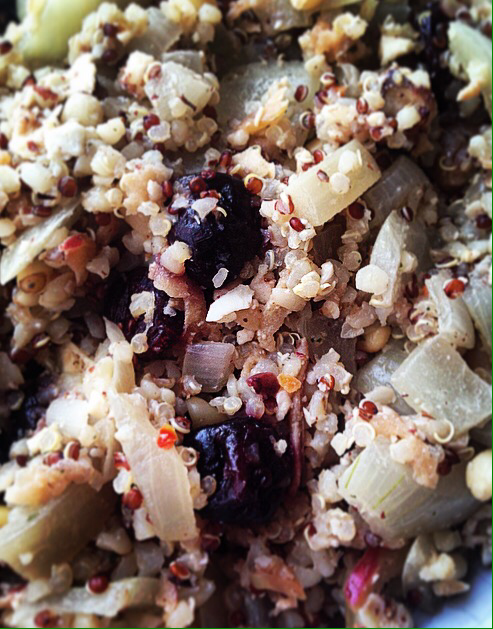 Add all remaining ingredients to the cooked quinoa and mix thoroughly. Pack lightly into uncooked turkey. 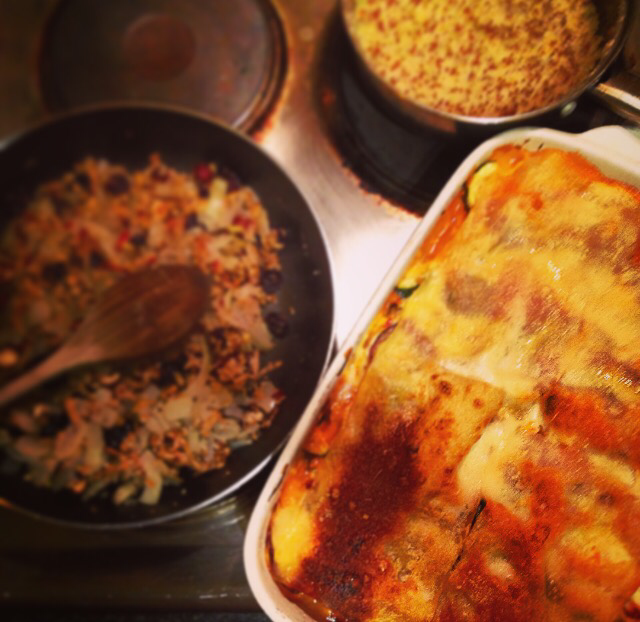 Lasagne is one of my all-time favourites comfort foods. It’s hearty and filling and packed with flavour. 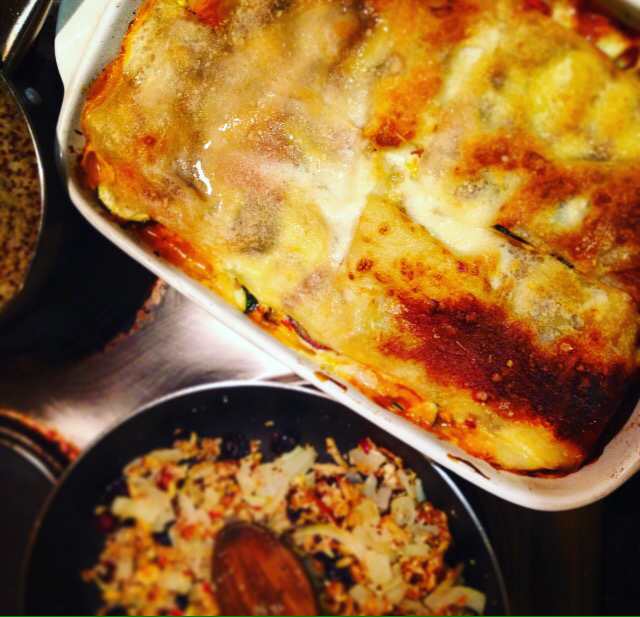 It’s a great one to make for meal prep too as it freezes well and one large lasagne tray can give you about 6 portions – ideal! I have been packing in the carbs since the weather turned, I know I know, I’m so ashamed but I couldn’t fight the cravings any longer and these cold winter nights were just asking for it. So I wanted to balance out the badness a bit by adding more vegetables. 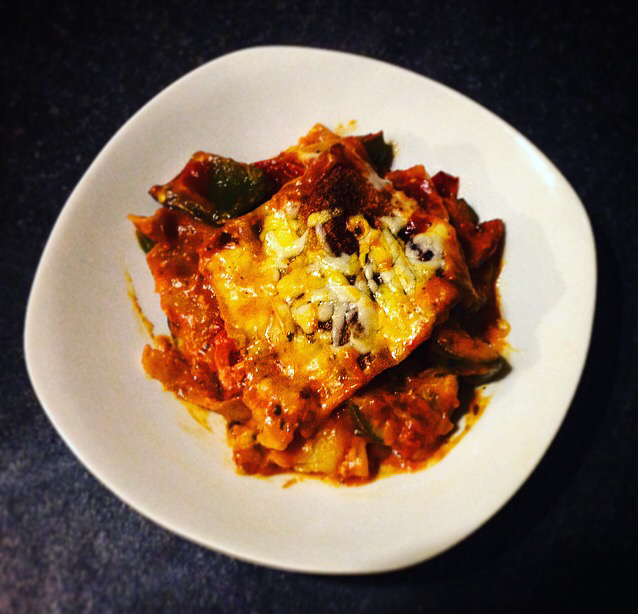 I tried a gorgeous Mediterranean lasagne in the Happy Pear restaurant during the summer and I also make a mean zucchini lasagne so I started the thought process with both of these ideas and the below was their love child. A colourful combo of roast veg, tomato and white sauce and lots of cheese, this vegetarian lasagne alternative is definitely a Winning Winter Warmer of a meal. It’s also economical to buy with all the ingredients coming to about €10 and its quick and simple to put together. A basic jar of tomato sauce will do if you’re not up to making your own and I’ve also put in some different ways to create your own white sauce from scratch too if you want to keep up the healthy buzz. I served mine with a few handfuls of spinach leaves and a drizzle of balsamic which went really well as a side. There’s loads going on in this dish though so it can be served on its own too if you want. A lot of the recipes I was researching included eggplant but I’m not a fan so I didn’t use it but if you want to mix it up a little, there’s plenty more vegetables like eggplant you can use. Whatever way you decide to make it, this dish is going to taste great and leave you feeling warm and full – enjoy! 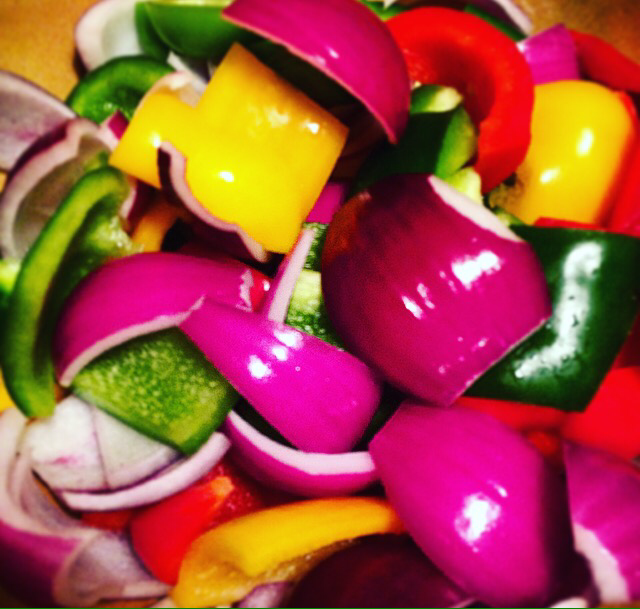 In a large oven dish, mix all of the red onions, peppers and garlic with dash of oil and some seasoning. Place the dish in the middle shelf of the oven and cook fr 30 minutes until the vegetables are soft. Add some oil to a hot pan on the hob and fry the zucchini for about 4 minutes or until browned. Transfer the fried zucchini to some kitchen towel and set aside. After the 30 minutes, remove the roasted vegetables from the oven and add the zucchini. Lower the oven to 200 Degrees Celsius. If you are making your own tomato and white sauces from, do so now. You can just leave out the chopped veg – mushrooms, carrots and peppers. This will make a delish tomato sauce! 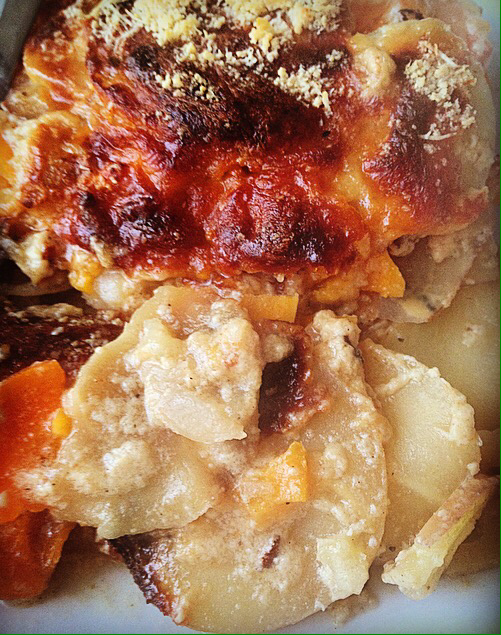 When both lasagne sauces are ready, remove half of the vegetable mix from the oven dish and spread the remaining veggies in one layer in the dish. 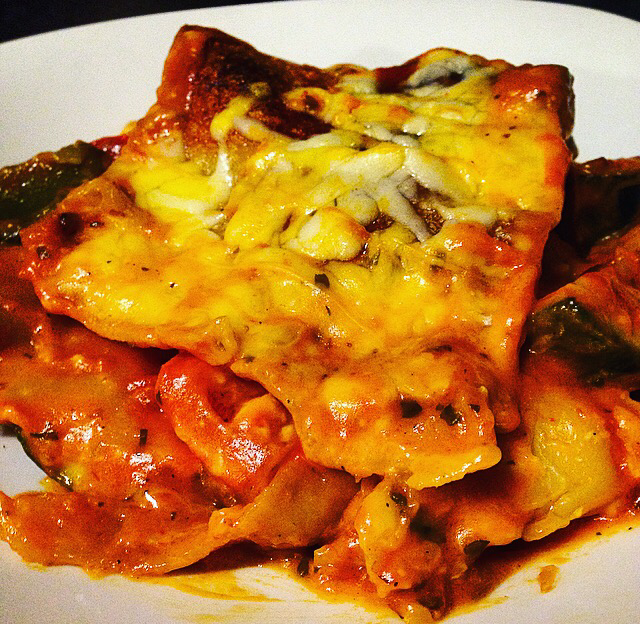 Pour half of the tomato sauce over the first layer of veggies and add a layer of lasagne sheets. Add half of your white sauce mix. Add the remaining veggies and repeat the step of adding tomato sauce, lasagne sheets and remaining white sauce. Sprinkle the lasagne with the parmesan. Place the lasagne in the oven and bake for about 40 minutes until golden brown. Serve your delicious vegetable lasagne with some side salad or on its own, whatever way you want – there is so much going on in this dish! 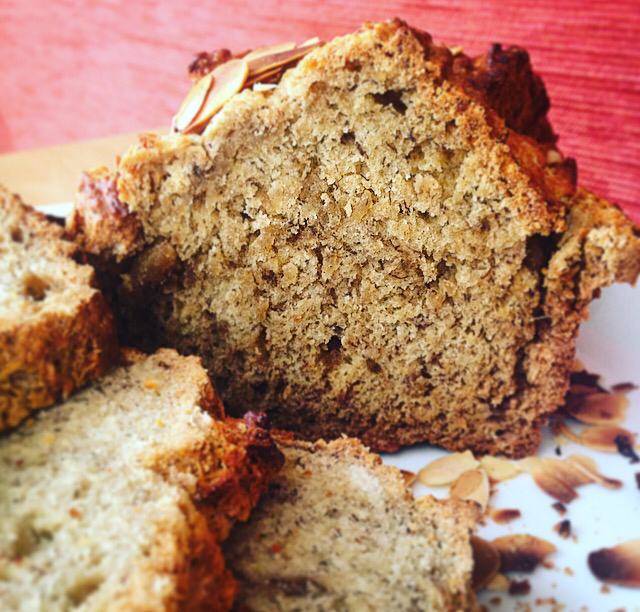 Banana Bread is one of life’s simple pleasures. It’s simple and tasty and such a good way to use up any uber-ripe bananas you didn’t get around to eating. On a scale of one-to-sweet, my recipe is pretty savoury – maybe a 1 or a 2 and the verdict from the office guinea pigs was an all-round thumbs up. I am much more of a Savoury than a Sweet so I pulled back on the sugar content of regular recipes and I was really happy with the result. 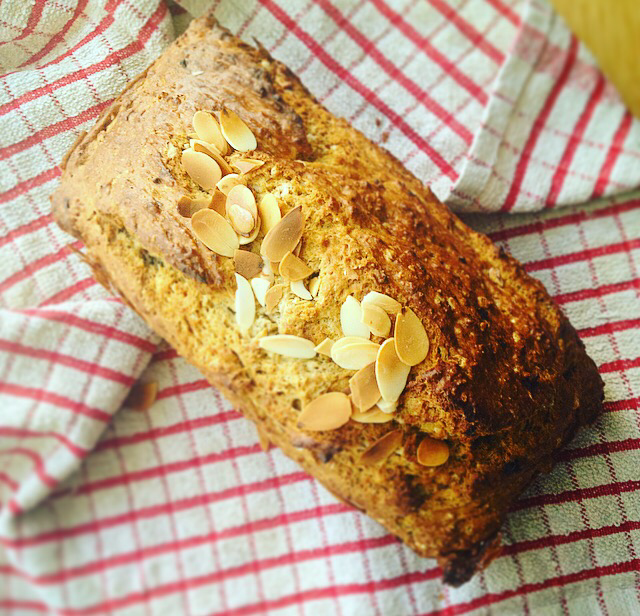 Banana Bread really is very easy and quick to make and will make a great breakfast-prep for a week in work. It is also lovely to pop in the oven early on a Saturday morning so those endless cups of tea that will be had over the weekend will have a yummy side kick. If you have kids it’s also a fun way to get them into the kitchen and curious about baking. This was one of the favourites when I looked after a gorgeous brother and sister in Oz. We loved to bake and they had serious sweet-tooths so this was a cheeky way to get one of their 5-a-day in. 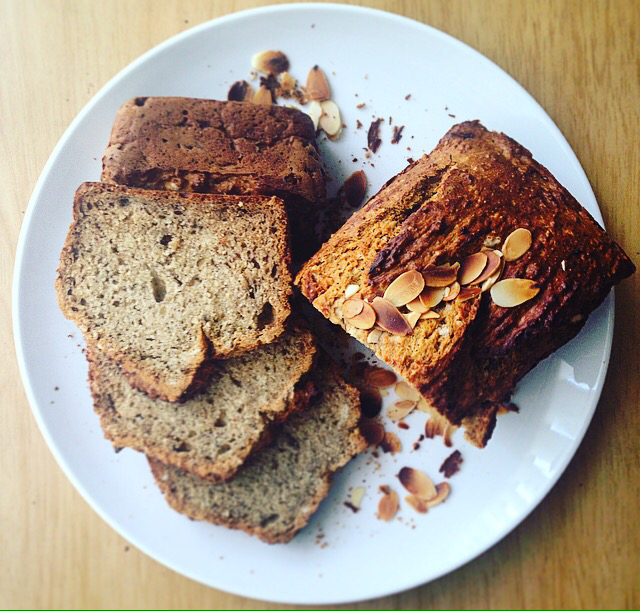 Depending on what recipe you use, there is still a significant amount of flour and sugar used in many Banana Bread recipes but I would still recommend a low-sugar recipe like below if you are looking to curb a craving but don’t want to dive head first into the biscuit tin. Most of the ingredients you should already have on-hand if you are a standard enough baker – the ingredients required are very basic so it won’t cost you the earth to go out and get the goods you need to put this lovely little loaf together. A great little tip my sister gave me too is if you don’t think you will use all the bananas before they do go off, chop them up and freeze them in individual portions to use for banana bread when you do feel like making some. They don’t take long to defrost and mash really well from frozen. In a large mixing bowl, add the bananas and mash them with a fork or potato masher. Once the bananas are mashed, add the remainder of the ingredients – be sure to sieve in the flour! Mix all of the ingredients together until a dough-like consistency is formed. Pour into a greased bread tin. Sprinkle the flaked almonds on the top and push them ever-so-slightly into the dough to secure them. Pop the bread tin in the oven on the middle shelf and bake for about 50 minutes (until cooked through). Once cooked, remove the loaf from the tin and let cool on a wire rack for about ten minutes. Slice the loaf like you would a regular bread loaf and apply butter or jam or whatever your choice of topping is and serve! So simple and sooo good! Happy New Year to all you Lovely Humans! 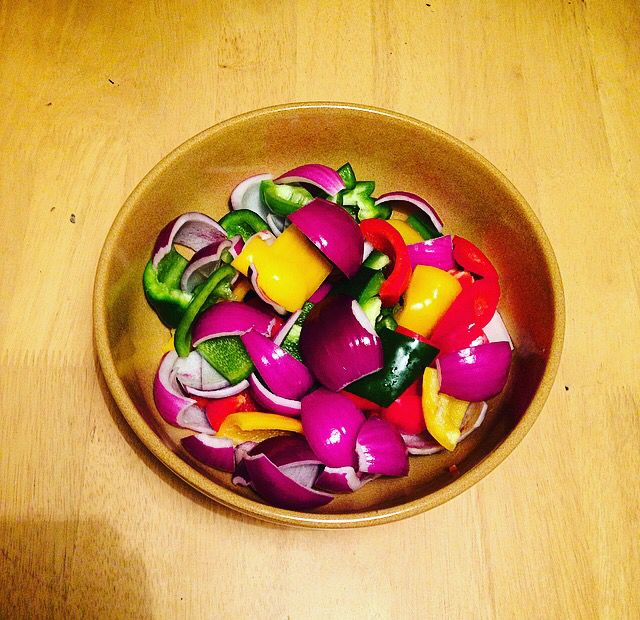 If you are reading this, I hope you have read some of my other posts and if so, I would like to first of all thank you for even bothering 🙂 This blog started as something to do at the weekends, to share my love of cooking and develop my knowledge of healthy food, its benefits to my health and how to make it good enough to eat. I honestly have no idea if people are even reading it so if you are, thank you. One of my 2017 Resolutions is to develop this blog more and explore other ways that I can share the benefits of healthy eating – and healthy cooking – with you all. I am almost finished a course in Nutrition and Food Science that I have found so informative and interesting. I have been jotting down so many new ideas for The Countertop so “watch this space” – lots of exciting posts and delicious recipes will be coming your way in 2017 if you stick with me. 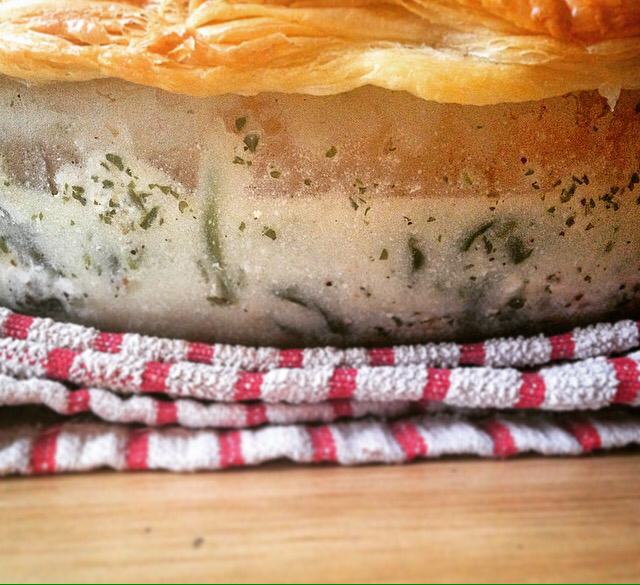 So, I thought I would kick of the New Year with an easy one – the humble Chicken Pie. If like me, you are not fully ready to dive feet first into Clean January but want to ease yourself in instead, then this recipe is perfect! This pie has all the elements of an indulgent meal but it is in-fact quite the opposite. When you break it down, the ingredients are all generally very healthy – chicken breast, spinach, almonds. Yes, the pastry might be a tad indulgent but when weighed out against the rest of the ingredients you will have nothing to feel bad about. The trick here is the mixture’s sauce. It will look and taste like you’ve landed a pint of double cream over the chicken pieces when you have really just combined some yummy almonds and chicken stock together! I was very excited when this experiment worked and the result really is delicious. It would be a great Sunday Dinner if you are at a loss as to what to cook today. It is a simple recipe with a truly comforting and tasty end result and will help you settle into Sunday evening nicely. Grease a small-medium size oven dish and put to one side. Chop the chicken fillets into small chunks. Heat the olive oil on a frying pan on the hob. Add the chopped onion and chicken pieces to the pan and fry until the chicken is cooked through and has browned. In a food blender, processor, Nutribullet (whatever you have available), add the chicken stock, crushed garlic, almonds, dried parsley and seasoning. Blend this mixture until it becomes smooth and creamy – add a little more almonds or stock until you reach your desired consistency. Once you are happy with your sauce, return the frying pan to the heat and add the sauce. Reduce the hob to a medium heat and stir the filling consistently for about a minute. It is at this stage that you can use your own judgement – if you think the mixture needs some corn flour to thicken or more seasoning etc, play around with it at this point. Once you are happy with the mixture, stir in the Spinach leaves and remove the pan from the heat. Roll out the pre-rolled pastry and cut it out to cover the oven dish – leaving an extra few centimetres to cover the edges. Pour the chicken filling from the pan into the oven dish. Cover the mixture with the puff pastry, securing it tightly over the edges of the dish. Place the dish on the middle shelf of the oven and cook as per the pastry’s cooking instructions (about 40 minutes usually). Once the pastry has cooked through, remove this delicious pie from the oven and serve. This will go great with many different sides. Try some fresh salad, sweet potato fries or steamed broccoli. I pretty much spent the last of this month’s pay cheque on a super long list of ingredients and fired up the oven. I’ve been preparing so many new Autumn/Winter recipes in my head the past couple of weeks so I thought it was about time I sat down and actually formulate, type and share them. This recipe is one I use so often and have done for years. Like Irish Soda Bread, scones are so much more than a traditional Irish food. Their taste can bring you back to years gone by or remind you of that great afternoon spent with friends or family chatting with a pot of tea. There is something about scones that make the Irish heart melt faster than the butter used with them. When we were away in Australia, tea and scones were a regular and love-filled treat that we would sit down and share together. A true reminder of home. Scones can be made sweet, plain or savoury to name but a few and today I am sharing a savoury recipe as this is the one I love the most. I’m not much of a sweet tooth but will work on putting together a sweet version of this if you guys are happy with how these turn out. Now the smell from the oven is telling me to wrap it up so I can enjoy one of these beauties with my cup of tea on this freezing Sunday afternoon. Enjoy folks! In a large mixing bowl, add the flour, butter, cheese, herbs, salt and baking soda and mix thoroughly. Use your fingertips to rub in any unmixed lumps of butter until you have a fine mix. Slowly pour in the buttermilk and mix until you get a dough-like consistency. Add a drop of water if the mix is too dry. Sprinkle some flour out on the countertop and transfer your dough from the bowl to the surface. Gently knead the dough until it is holding strong. Tear away small handfuls of the dough and roll into your scone shape. Place the scones on a lined baking tray. When all the dough has been used up, brush a small bit of buttermilk on each of the scones. Place the baking tray in the middle shelf of the oven and bake the scones for about 15 minutes. When the scones have turned a beautiful golden-brown colour and are cooked all the way through, remove from the oven.